Sun City Hilton Head is the largest active adult community in South Carolina. There are over 8,000 homes, world-class amenities and 54 holes of golf. At Sun City Hilton Head you can enjoy active adult living in one of South Carolina's most popular resort destinations. Since 1995, Sun City Hilton Head has been one of the most highly acclaimed active adult communities in the country. It is nestled in the semi-tropical low country of South Carolina where unspoiled sea marshes meet tall pines and ancient oaks. The mild marine climate has a yearly average temperature in the 70s that makes outdoor activity comfortable throughout the year. A bountiful lineup of amenities and social activity cater to adults who want a physically active and socially engaging lifestyle. As a result, retirees from across the country have flocked to this beautiful community. A 45-acre Village Center at the heart of the community boasts an amenity campus that resembles a southern town square complete with a clock tower. The Town Square provides a unique blend of old world charm combined with brand new amenities. Anchoring one end of the square is The Pinckney Social Hall, which is a 17,000 square-foot venue with a ballroom. It hosts lectures, workshops, dances and concerts. At the other end of the square is the The Purrysburg Fitness Center, which has a state-of-the-art fitness facility, indoor and outdoor pools, and a cushioned-floor aerobics studio. The Yemassee Crafts Center building is also located on the square and includes studios for ceramics, arts and crafts, sewing, and photography. Magnolia Hall is a performing arts center in this active adult community. The 16,000 square-foot center offers stadium style seating for 540 people. The facility plays host to a variety of theatrical performances, lectures, and concerts. The Hidden Cypress Fitness Center is a workout facility that overlooks the beautiful Hidden Cypress Golf Course. It includes a state-of-the-art fitness center, meeting rooms, outdoor pool, and restaurant. There is also a large woodworking shop with an area for model railroad enthusiasts. Construction of the final amenity center was completed in 2012. This new state-of-the-art venue has an indoor and outdoor pool, and more bocce ball, tennis, and pickleball courts. The grounds are an active adult playground adorned with 12 Har-Tru tennis courts, a softball field, pickleball and bocce ball courts, a dog park, and outdoor party pavilion. Lake Somerset is a 20-acre fishing lake within Sun City Hilton Head that offers great catch and release fishing. The lake provides gorgeous views and remote controlled sailboats are a common site. Elevated boardwalks and miles of walking and biking trails meander through acres of majestic oaks, pines, and wetlands. There are three 18-hole championship golf courses. The Okatie Creek Golf Club and Hidden Cypress Golf Club were both designed by PGA tour professional Mark McCumber. The courses boast lush greens and extensive waterways that provide for an exciting and memorable round of golf for both experts and beginners. The latest 18-hole Argent Lakes executive course is also available for golf enthusiasts. Residents of this 55+ community have a total of 54 holes of golf available for play every day. After a round of golf, residents can gather with friends for drinks or a bite to eat. There are two dining options in Sun City Hilton Head, both named Jameson's Grille. These restaurants serve a wide selection of appetizers, sandwiches, and burgers as well as traditional pub fare that's ideal for casual dinners. 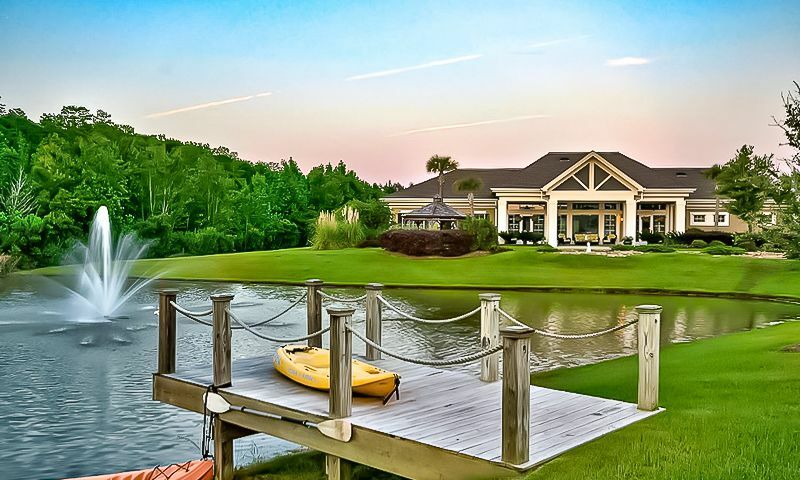 There are numerous choices for homebuyers in Sun City Hilton Head. Housing options include 1,000 square-foot villa townhomes all the way to 4,000 square-foot custom single-family homes. A wide array of home styles and floor plans cater to the needs of active adults who want low-maintenance ranch home living. The homes have been thoughtfully designed around the needs of active adult buyers. Expansive great rooms, entertaining kitchens, and ample outdoor living space are showcased on most homes in the community. Many of the home sites enjoy magnificent golf course and nature views. There are both new construction and pre-owned resale homes for sale in this development. There have been several dozen different floor plans offered since the community started construction in 1995. Buyers opting for new construction can select from a vast selection of different single-family models. The resale home market has an ever-changing selection of various floor plans that include single-family and villa townhomes. Additionally, the exclusive waterfront Riverbend neighborhood boasts a fine selection of custom built homes on oversized lots. In the Riverbend area homebuyers can purchase vacant lots and build a custom home with no required timeframe. Lifestyle takes center stage at Sun City Hilton Head. There are over 200 chartered clubs and interest groups in the community that cater to a vast audience. Whether your passions include sports, fitness, socializing, arts and crafts, religion, continuing education, or cards and games, there is something for everyone. Between the various club meetings, day trips, classes, lectures, and social events, your biggest dilemma will be to figure out a way to fit everything into your schedule. Continuing education is also a big focus for many of the residents. In addition to the various continuing education courses offered in the community, the adjacent New River Campus of the University of South Carolina and Technical College of the Lowcountry offer credit and non-credit continuing education classes for Del Webb residents. The Osher Lifelong Learning Institute also offers residents non-credit courses for educational enrichment. Sun City Hilton Head is conveniently located 13 miles west of world famous Hilton Head Island in Bluffton, SC. The area is revered for great beaches, famous golf courses, and unique boutiques. The Okatie Center, a 268-acre shopping and commercial center adjacent to Sun City, is accessible via golf cart. It includes banks, hotels, restaurants, a grocery store, and more. Several miles away, Berkeley Place is home to the Cinemark Theater and great shopping and dining outlets. There are many cultural and recreational attractions on Hilton Head Island and the surrounding area that makes Sun City Hilton Head a great active adult community to call home. Pinckney Social Hall - 17,000 Sq. Ft. There are plenty of activities available in Sun City Hilton Head. Here is a sample of some of the clubs, activities and classes offered here. These attached homes are available on a resale-only basis. They have 1,039 to 1,498 square feet of living space and offer two to three bedrooms, two bathrooms, and an attached two-car garage. These attached homes are available on a resale-only basis. They range from 1,055 to 1,936 square feet and have two to three bedrooms, two bathrooms, and an attached two-car garage. These homes are available on a resale-only basis. These single-family homes have 1,085 to 1,524 square feet of living space and feature one to two bedrooms, one-and-a-half to two bathrooms, and one to one-and-a-half-car garage. These single-family homes are available on a resale-only basis. They have one to two bedrooms, one-and-a-half to two bathrooms, and one to one-and-a-half-car garages. The single-family homes from the Classic Collection 1 offer 1,151 to 1,631 square feet of living space. They have two to three bedrooms, two bathrooms, and an attached two-car garage. These homes are available on a resale-only basis. These single-family homes offer 1,152 to 1,424 square feet of living space. They have one to three bedrooms, one-and-a-half to three bathrooms, and an attached two-car garage. These homes are available as new construction and resale. These single-family homes are available on a resale-only basis. They have two bedrooms, two bathrooms, and an attached two-car garage and range in size from 1,243 to 1,598 square feet. Single-family homes in the Jasmine Collection 2 offer 1,152 to 1,424 square feet of living space. They have two bedrooms, two bathrooms, and an attached two-car garage. These homes are available on a resale-only basis. These single-family homes are available on a resale-only basis. They offer 1,634 to 2,085 square feet of living space and have two to three bedrooms, two to two-and-a-half bathrooms, and a two-car garage. These homes are available on a resale-only basis. They have two bedrooms, two bathrooms, and an attached two-car garage. These single-family homes range from 1,634 to 2,106 square feet. These single-family homes are available on a resale-only basis. They have 1,502 to 1,962 square feet of living space. These homes have two to three bedrooms, two bathrooms, and an attached two-car garage. These homes are available on a resale-only basis. These single-family homes have 1,590 to 2,722 square feet and feature two to four bedrooms, two or three bathrooms, and an attached two or three-car garage. These homes have an optional second-floor loft that can added extra bedrooms and bathrooms. The Expedition Collection consists of single-family homes that range from 1,656 to 1,961 square feet. They have two or three bedrooms, two or three bathrooms, and two to two-and-a-half-car garage. These homes are available as new construction or resale. These homes are available on a resale-only basis. These single-family homes range from 2,044 to 2,597 square feet. They have two to three bedrooms, two to three-and-a-half bathrooms, and an attached two-car garage. These single-family homes are available on a resale-only basis. They have two to three bedrooms, two to three-and-a-half bathrooms, and an attached two-car garage. These single-family homes are available on a resale-only basis. The Estate Collection ranges from 2,397 to 2,958 square feet and offer two to three bedrooms, two to two-and-a-half bathrooms, and two to two-and-a-half-car garages. These single-family homes offer 2,411 to 2,562 square feet of living space. They have two to three bedrooms, two to three-and-a-half bathrooms, and an attached two to three-car garage. These homes are available as new construction or resale. Community is growing too big. The developer not inclined to add additional or expanded amenities to accommodate the growing population. (Developer is going to add approximately 450 new houses in addition to the original 8200 homes planned. The kayak on the website picture is misleading. No Kayaks, canoes or boats are allowed in the lagoons/ponds. DO NOT buy an existing stucco home in SCHH (unless it has been properly re-sided) - over 5,000 homes have been built with defective stucco application. We're talking excess moisture, rot, and dangerous mold. Nearly all these homes will have some degree of damage, Typical repair costs run between $20K to $60K depending on damage and size. Largest class action suit in SC history has been settled, but new buyers will not get a dime of this. Oldest and newer homes have Hardie siding which should be fine. We have lived here for over 6 years, we have traveled all around the US and internationally. The activities, people are really fun, engaging, and friendly. Can't believe there is any place better to live all things considered. I moved here 8 years ago. It’s a great place to live. The amenities, location, cost of living and climate all contribute to excellent opportunities for retirees. You can be as busy and as active as you want to be. The newer homes where I live are located north of Fording Island Road in Jasper County. Although the real estate and property taxes are higher than those on the south side in Beaufort County, they are still very reasonable. The only caution related to the north side homes is that they are designated as a managed neighborhood. As such, there is a mandatory benefitted landscape assessment. The landscape services are provided by a contractor selected by the Board of Directors so homeowners have little control over the quality of the work performed on their property. Great place to live because of the people in all the neighborhoods. I am going on 10 years now. Houses are now built by Pultie not Dell Web (houses have not built here for 10 plus years. Not exactly quality houses had major stucco issues with law suite. Joan Kelly was my broker for a resale home (straight shooter I recommend). Almost everybody is happy here (something for everybody). Rules here make sense for the most part,.amenities live up to hipe . After you get moved in you will be happy your here the important thing. A resale on the South side has lower taxes. they wont tell you that. After all said and done it was a great move for me. Be a smart buyer !!!!! This is a wonderful place to retire. Very upscale area, warm climate, incredible beaches. So many amenities at Sun City. Del Webb does not build developments this large anymore so this resort has a lot of amenities that are not at some of the newer resorts. There are resales, new construction and you can even build a custom home in Riverbend. This is the only Del Webb retirement community in the nation that has a section where you can build a complete custom home. We have met many nice people that live here. Everything you need is close by. We love it here. Terrible place to do business with. They are so desperate to steal your money they will keep deposits and not refund them. Don't go there or do business with them unless you wish to be robbed and be with a bunch of people that are really old. I feel like I like in a resort year round! We are so happy we moved out of Chicago because we were sick and tired of the below zero weather and the snow. Moving to Sun City Hilton Head has been a dream come true - we are kicking ourselves for not moving sooner. The clubhouse, pools, fitness centers, clubs and organized activities are even better than we thought! Yes, the communities does have restrictions on what you can do on the exterior of the home, but we like it because it makes sure your neighbor isn't going to add a shed in their backyard. The residents here are some of the nicest people you will ever meet! Don't wait! Be very careful when purchasing a home here. Realtors and developers do not disclose all rules and regulations prior to sale. With so many restrictions, many may not feel "free". There are many activities and volunteer opportunities -most at modest expense. And nearby at a very affordable price. I think values here will rise steadily over the next 5 yrs. I totally concur with the other reviews that have been written. The reviews of SCHH that I've read are mostly from new comers. My wife, and I, have lived here ten years. We are as just as happy now, if not more, as we were when we first moved here. This is a fantastic community to live in, with some really great people, nice homes, and a fantastic lifestyle. We often refer to this place as a gigantic playground for we older folks. As the other reviewers have said, there is something to do here for everyone. Definitely consider moving here, if you're looking for a great place to retire. Beware though, that it does get hot, and humid in the summer, but remember that you'll be in the deep south, and also consider that it doesn't snow, or get too cold in the winter. You'll adjust to the H & H, and you'll be able to be outside playing practically the whole year. We came here from Connecticut in October 2013 to avoid the high taxes & cold snowy winters. We found more than that here in SCHH. Lots of activities,beaches & things to do in retirement. We are happy we made the move! Came here for a lower cost of living compared to Washington, DC. Had no idea how much lower it is down here. Folks up north have got a clue how much they are being gouged by there state and local governments till they come down here. Also I wanted to retire near the water. We moved to SCHH in 2010 after living all of our lives in the Charleston and Hilton Head areas. We couldn't imagine living anywhere else. The social life here is fabulous and we've met wonderful people. On any given day we can have something fun to do, if we want to. If not, that's ok too! Our home here is lovely, the community amenities are outstanding and you'll have a great time living here. We HIGHLY recommend it! This is a beautiful place. There are so many choices of activities and clubs to keep busy. You can choose to do a lot, a little, or just relax and enjoy a wonderful home. We have been living in our delightful cottage for 6 months and love it. We just can't say enough about this wonderful place. We highly recommend SCHH to everyone. We have been residents since 2005 and have found a fulfilling retirement here. So much to do, we look forward to weekends so we can relax a little. People here are active, busy, learning and creating in so many ways. If you are looking for a place to retire, as YOU define it, then Sun City Hilton Head is your new home. Homes are available new or from local realtors. 55places.com is not affiliated with the developer(s) or homeowners association of Sun City Hilton Head. The information you submit is distributed to a 55places.com Partner Agent, who is a licensed real estate agent. The information regarding Sun City Hilton Head has not been verified or approved by the developer or homeowners association. Please verify all information prior to purchasing. 55places.com is not responsible for any errors regarding the information displayed on this website.